Non-prescription skin care products can contribute to good skin, minimizing the effects of environment on the skin and potentially curb photoaging. Cosmeceuticals, contends Dr. Smeltzer, contain active ingredients that can make a difference in the structure and function of the skin without there being a need to use prescription-strength products. Indeed, the skin is more luminous and luminescent with effect moisturization. Moisturizers like the ceramide-containing products can work by replenishing oil in the skin while humectants allow water absorption into the skin through the deeper layers of the skin, explains Dr. Smeltzer. Products that are Vitamin A derivatives, containing one per cent retinol or greater, can work to reverse the signs of aging, according to Dermatologist Dr. Lisa Kellett, Medical Director at DLK on Avenue in Toronto. Along with Vitamin A, Vitamin C is integral to a good skin care regimen. In sufficient concentrations, Vitamin C can treat brown spots associated with aging, notes Dr. Kellett. “You have to look for 25 per cent of higher Vitamin C,” explains Dr. Kellett. Sunscreen use is vital to protect the skin. 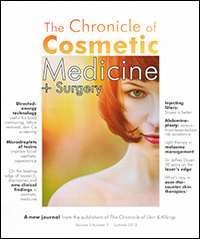 Novel delivery systems are making individuals more compliant with using sunscreens, observes Dr. Kellett, noting a sunscreen that has at least a Sun Protection Factor number of 30 needs to be applied generously and applied regularly.